This week I've been busy painting Space Wolves, so I watched Luke and James play a game. 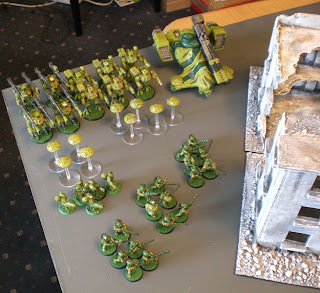 Luke had his jungle camo Tau and James had his new Dark Angels space marine army. 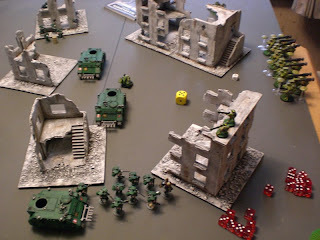 This game of Tau VS Dark Angels was interesting to watch, not only because I could see how James's new army works in a game of objective grabbing, but also to see how Luke's 'fire power castle' army from 4th edition Warhammer 40K would fair in 5th edition. To be fair, Luke hasn't played my 5th edition 40K since the 2008 GT and then Carnage back in March. He's yet to abandon the notion that the Tau can outgun people and hold their ground. Sadly it just isn't true and as a result his force isn't particularly mobile. But considering how stuck in his ways he may be, he actually plays quite well in this game. The concept of reserves is still very alien to him, but I'm convinced that if he spent more time playing games and trying out new things, that he'd do a lot better. The same could be said for James, but he's playing Space Marines, which are a far more forgiving army. Tau Hammerhead with ion cannon, smart missile system, multi tracker, disruption pod, target lock. They rolled for the number of counters, getting a total of 3, which they proceeded to place around the centre. One in the open, about 24" from the board edge, anotherone in a building 24" on and the third in the centre, roughly 18" on from the board edge. I laughed, saying which board edge was obviously best...before James won the roll to go first and immediately chose that board edge and set up his entire army in a big line while his scouts infiltrated. In response Luke put everything in the right corner (miles away from the objectives) while his Stealth Suits would be infiltrating. I did suggest putting his entire force into reserve, but he was having none of it. 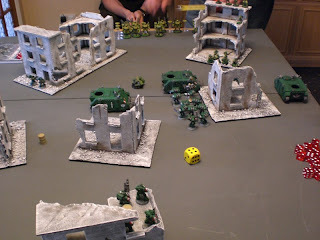 The dark angels scouts deployed in the buildings flanking Luke's army for some first turn sniper shots. Luke deployed his Stealth Suits behind a building across from his main force, ready to shoot one of the scout squads on the first turn. In typical James style, his whole army surged forward on to the objectives. Luke immobilised one of the transports and inflicted some damage on the Devastator squad while blowing the heavy bolters from one of the razorbacks. The scout squad near the Stealth Suits are wiped out. In return James immbolised the Hammerhead. 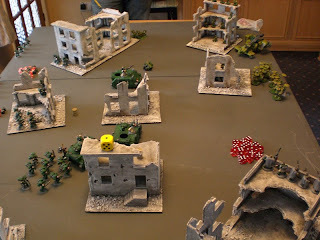 James continued his advance while the combat squads with heavy weapons moved to hold the objectives in following turns. Three of the space marine squads disembark. One rapid fires its plasma gun at the Tau Battlesuits to no effect. Another runs forward to rapid fire the Firewarriors in the building while the squad in the immobilised razorback disembark and charge the Firewarriors in the building, wiping them out. Under pressure and with the Assault Squad led by the Cheese Vicar closing in, Luke is forced to pull back, firing as he goes, inflicting more casualties on the Devastator squad, but finding his fire power ineffective against the advancing Razorbacks. Another turn of the Dark Angels advancing while the Tau retreat up the flank and finally the Razorbacks are all destroyed or immobilised. All 3 of the combat squads are wiped out and only the Assault Squad and Cheese Vicar remain, who hide behind an immobilised Razorback, ready to pounce. The Hammerhead is penetrated and destroyed by concentrated fire from the heavy weapon combat squads and the 3 remaining Devastators. Luke continues to retreat, firing with little effect at the Assault Squad who gain cover saves against all of the rail gun slugs and plasma rifle shots that come their way and only lose 4 of their squad before hacking apart one of the Broadside teams in close combat. Luke is about to call the game, but I point out how he can attempt a draw, but the game ends on Turn 6. A bit of a quicker battle report write up than usual, but I wasn't playing, so I couldn't remember every single event. 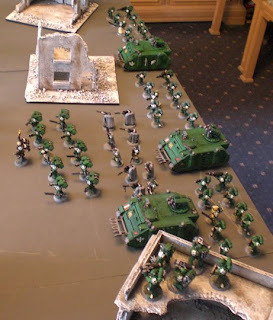 For me this was more about Luke's Tau army than James's Dark Angels army. 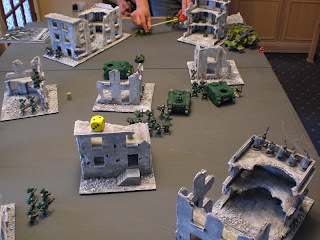 But this is a Tau blog and I am a Tau player, so it's little surprise. Plus, I did help James to write his army list. As I've said before on this blog "He who sits in the corner, dies in the corner" and it couldn't be more true of Luke's army. However, he did start sweeping round, so perhaps there's hope for him yet. From Turn 2 onwards, James could have just sat on the objectives and let Luke try to dig him out. But, having played Tau before (usually my mechanised list), he knew to keep the pressure on and herd the Tau around the board with his faster moving units. It's in this area that Luke really suffered. Having deployed his army of slow infantry units in the corner, there was nowhere to run...well, there was, but only in 1 direction. Because his Firewarriors aren't in transports, they'll never reach objectives. And because he clumped everything together, James could simply steam his army towards him en masse. Luke had an entire board length to deploy across. By spreading out his army, James would in turn have to divide his army to reach him. Alternatively, Luke could have chosen to keep most of his army in reserve, then put each unit in an ideal place to counter whatever James was up to. But once again, mobility would be his biggest issue. I don't want to compare his Tau army list to mine, because I'll end up trying to say that my Tau list is perfect -which it isn't. But, the Stealth Suits were rubbish and for fewer points he could have taken a twin linked flamer and missile pod battlesuit team, which has proven to be far more effective. What I will say is that his army could have done with a couple of Markerlights to ensure that what he needed to kill at all costs actually took some damage. His Tau Battlesuits and Broadsides continually missed or did little damage due to cover saves throughout the game and it really hurt his performance. I'll never understand why some Tau players insist that they are capable of winning games with a static gunline. This wasn't true when the army was first introduced. It wasn't true in 4th edition with the then-new codex. With the exception of Kroot, Tau are *way* overpriced in the current market. What keeps us competitive is our ability to mechanize with near-constant 4+ cover saves (take away disruption pods and this army falls off the radar FAST), use markerlights as a force multiplier (sometimes more importantly, to deny enemy cover saves! ), and the fact that there are almost no weapons less than S5 anywhere in our arsenal. We can field a massive amount of mobile AP 1 and AP 2 weaponry as well as use that mobility to focus the rest of our very excellent weaponry to bear on a small portion of an enemy. The DA army featured in this batrep has a marginally better army list. But only just barely. As you noted, neither of these players has wizened up to the nuances of 5th edition, even though it's been a year that it's been out! No wonder you've been beating them every time you play them! James is a bit better. His Ravenwing army is horrible to play against, but he's still yet to master them. 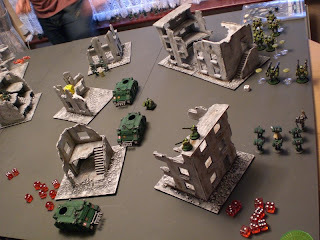 A static gunline may not be the best, but at last years Ard Boyz tourney I was in, both Tau players were heavy mech (and longtime players) and were soundly beaten in all 3 rounds. As a matter of fact, 1 was defeted in h-t-h in turn 1, by the tourney winner's Nid army. Now, we have a new Tau player who dosen't use skimmers at all and the last time he lost (10-1 is his Tau record in our gaming group) was against my 2 units of Nobz bikers list. Personaly, I mix mine up, with 1-2 fire warriors squads in transports, the rest on foot.